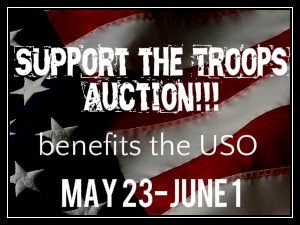 herding cats & burning soup: Last Chance for the Support The Troops Auction plus a little about the USO! + giveaway chances! 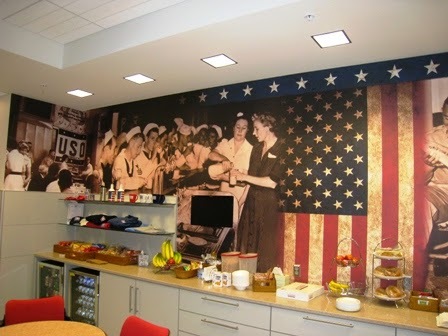 The USO of North Carolina is made up of 5 centers and a mobile unit with the mission of lifting the spirits of military families in our state (or that are traveling through). Each year the 700some volunteers provide assistance and support to over 400,000 service members and their families. 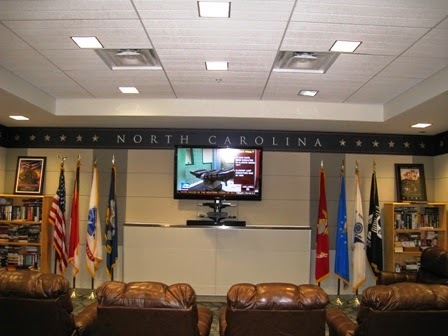 A couple years ago now I started volunteering at our USO center at the RDU airport here in North Carolina. I wanted to be able to do...something and it sounded like a great opportunity to give a little back. There was a need for overnight volunteers at our center which was perfect for me so as often as I can (usually 2-4 times per month) I head over and spend the night from 11PM to 7am manning our welcome center. And if weather is bad like it was this winter I'm one of the volunteers on call to come in since I live so close. So...what does our USO do? Well, all kinds of things! At our branch we're at a large airport and have a lounge where service members or their families can come to relax while they're traveling, get help if they're having flight troubles and things like that. We've got a computer center, a lounge for tv and sleeping, a children's area and a kitchen area where we provide everything from complimentary snacks and drinks to full hot meals. Some will just come in for a few minutes to grab a snack before a flight but others end up needing to stay longer. Either from missed flights or delays and cancellations. Our center is open 24/7/365 so no matter when we're needed there's a volunteer there and the center is open. Even during ice storms like we had this winter. There are also groups of volunteers who make up an Honors Support Team that comes in to assist families of fallen soldiers and stays with them while their love ones come home and does plane side military honors. We have groups that help with deployments and to celebrate homecomings. And do events like Holiday in the Hanger which is a huge Christmas celebration for military families and their kids to come out and see Santa, have a delicious meal together and all kinds of carnival rides. It's a great time. Because of where we're located--we've got Military bases all around us--we have large groups of Marines coming through on a regular basis after they've gone through training near by. So we'll have days where 170+ young Marines come through as a group on top of the regular visitors. Most are away from home for the first time, some have never flown before, aren't really sure...what they're doing and we're there to kind of ease that along. Get them well fed and loaded up on snacks to take with them, talk them through travel jitters and just provide a friendly environment and smiling face when they need it. It's always high energy and something to behold seeing all those young men and women. Other USO branches in NC do things like Single Warriors Birthday Cakes where they basically make birthday goodies for single service members to remind them they aren't alone on their special day. And programs where parents who are deploying can come in and read bed time stories on video for their kids that are then delivered after they deployed. There's a ton of other stuff as well like getting passes for sporting events and other events like that, a food pantry and financial guidance/classes. Just things that make life a little brighter and offer support when needed. So that's the USO. It's a great organization I'm so glad I've been able to get involved with. I'm blown away every time I go in by the men and women who serve and by their families. Thank you all for helping me do a little more for the cause. The USO is always looking for volunteers. There are centers all over the world and so many ways to get involved. Even if you can't donate financially or by coming in to a center to volunteer set hours at centers like ours you can do things like baking cookies or pastas and bringing those in. Or donating groceries that can be made up at the center. There's an endless amount of ways to get involved. 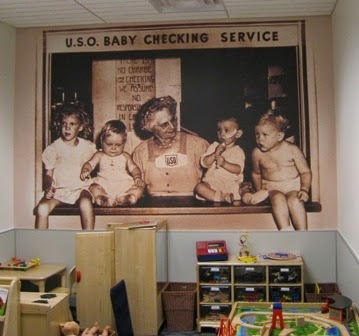 Just check out your own USO center and give them a ring. There's a list of USO centers world wide HERE. I hope yall will consider getting involved! It's an amazing experience no question. SO! What can you do today to help??! Spread the word about the Auction! It's almost over and I'd love to see that donation level eek up just a bit higher! There are 32 prize packs you can bid on from authors like Shayla Black, Sharon Hamilton, Cherise Sinclair, Julie Ann Walker, Lori Foster, Kallypso Masters, Kristen Ashley and so many more. It's for a good cause so don't be shy! I'll be posting each image to our FB page starting tonight (5/31) and sharing those can win you even more books! Do you volunteer with a Military Support Group? 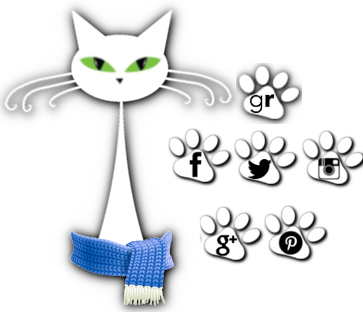 Tell us a little about it!